At these fairs, CARLISLE® CM Europe presented for the first time its new booth concept and design which underlines the umbrella brand strategy of CARLISLE® CM Europe. The open and inviting booth design allows you to experience the unique product benefits of HERTALAN®, RESITRIX® and HARDCAST® by viewing live demonstrations which successfully attracted numerous roofers, carpenters, industrial plumbers, architects and planners. 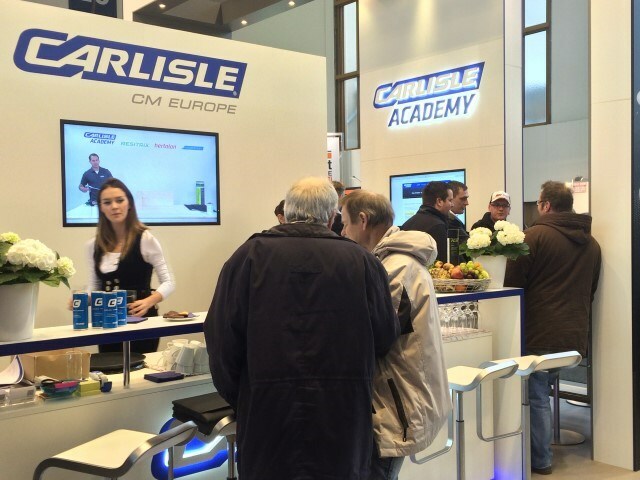 During the 2016 trade fairs, many new and promising contacts for CARLISLE® CM Europe could be made. Now, the preparations for other important meeting point of the construction industry have already started: From 22-24 March CCM-BV will exhibit at the Building Holland in Amsterdam, from January 16 to 21, 2017, CARLISLE® CM Europe will join the BAU Munich for the first time as an exhibitor (the world’s leading fair for architecture, materials and systems) and in Februari 2017 "De Bouwbeurs" in Utrecht the Netherlands.